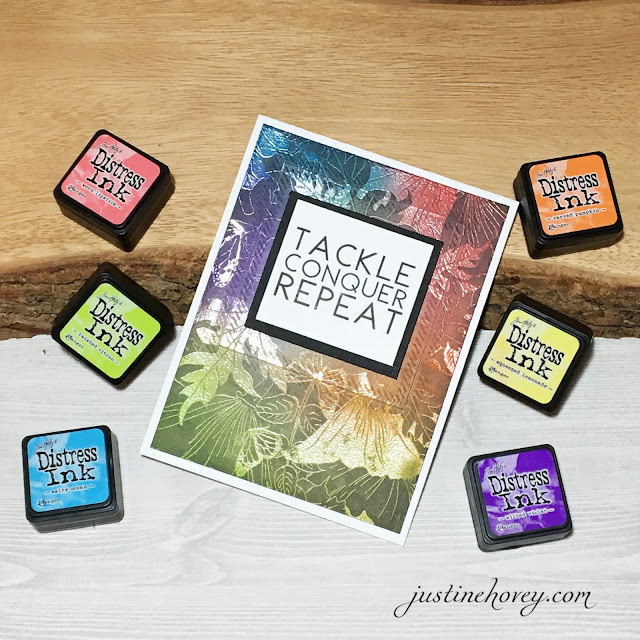 Justine's Cardmaking: The Ton Anniversary Blog Hop & Release! 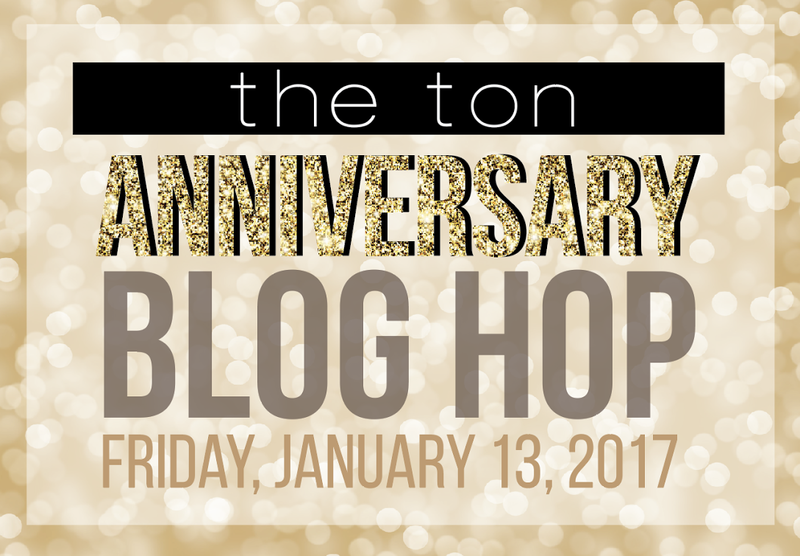 The Ton Anniversary Blog Hop & Release! 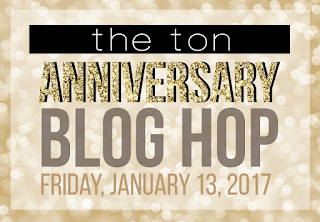 welcome to The Ton Anniversary Blog Hop! The Ton has 26 new stamps for their 2017 Anniversary Release which include three free gift with purchases. For more information on The Ton’s inventive products, head over to The Ton. All new release products are available now! We have lots of inspiration for you today featuring all the new stamps. I used The New Pretty for the sentiments and Poppy Garden for the backgrounds and I created two cards and two video tutorials to show you how. 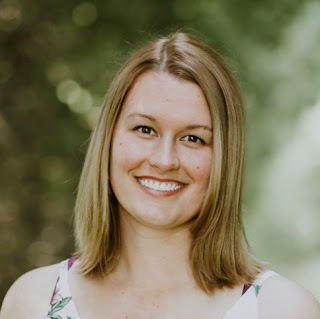 Comment on the Blog Hop posts for a chance to win one $75, two $50 and two $25 gift certificates! To qualify, you must also leave a comment on The Ton Blog Hop post. The comment period will close on Monday, January 16th at 11:59pm. Winners will be announced thereafter. Quick and easy with very few supplies! I love this coordinating envelope! Such an extra special touch to the card! For this card, I used the Joesph's Coat technique which I demonstrate in the video below. Pretty much you stamp over a coloured background and clear heat emboss it, then cover it in black ink. TaeEun Yoo - GO HERE NEXT! This is a real cool video. I don't have many background stamps, but now know how to use them. How about that misti? Great huh? I love mine. Beautiful cards!! Thanks for sharing video tutorials :) really enjoyed watching. I love your cards. I am going to try the Joseph technique with my Ton BG stamps. Awesome effect. 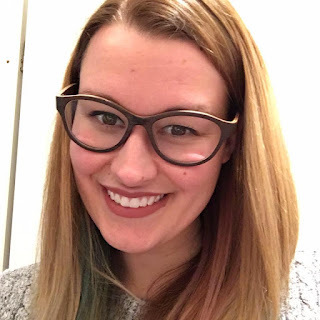 I always enjoy your videos, Justine! This one was no exception. Both cards are really lovely and shiny!! Thank you for celebrating our Anniversary with us! 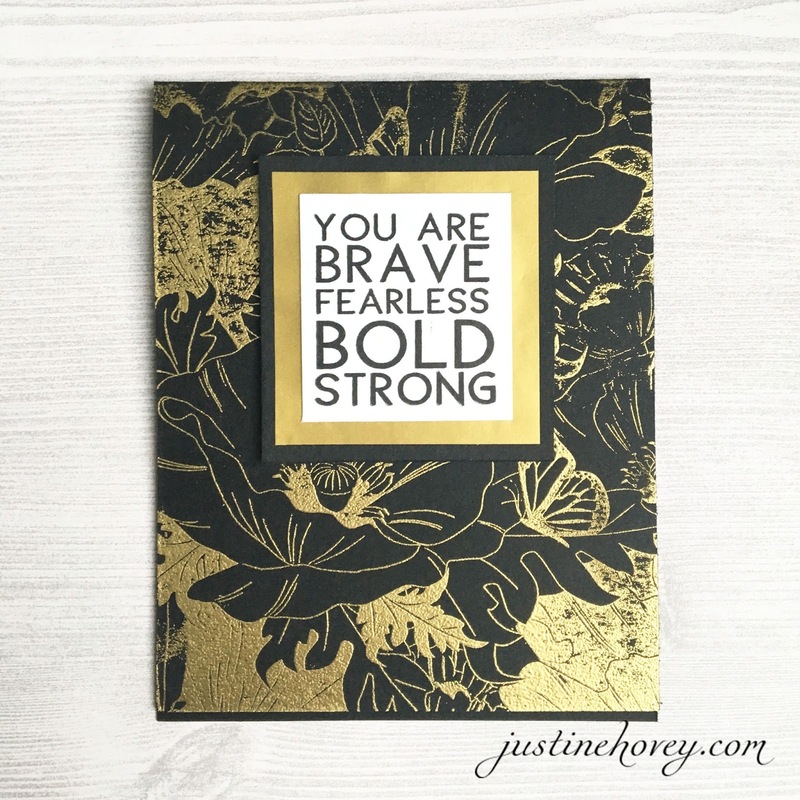 Amazing cards, Justine! LOVE them!!! Holy smokes! I am having trouble finding the right words to describe how these cards make me feel! They are gorgeous, amazing, brilliant, breathtaking, awesome, divine, mind blowing and WOW! Out of this world spectaculocity! Wow seems to be the only word I can form right now!! Totally amazing cards! TFS! Wow, I'm speechless. These 2 cards are spectacular. I love techniques and designs using black cardstock. So beautiful. Thanks for sharing. gold and black is my fave!! you are truly a master at card making!! Thank you for the video. Great technique! Oh my goodness!!! Beautiful cards and colouring!!! Love them!!! Thanks for sharing your video! I love those sentiments! I have so many young women in my life that need encouragement! I loved the videos. Beautiful cards! You really made those wonderful sentiments pop! Love the striking gold embossing with the black cardstock! What pretty cards. Thanks for sharing. Beautiful cards!! I saw both videos! Thank you for sharing them! Love that Joseph's coat technique. The gold on black is stunning! I love Ton's background stamps! Justine, your card is gorgeous. Just stunning! Gotta practice that Joseph's Coat technique. Great sentiments and I like the gold embossing on the first and the technique on the second. Your cards are really gorgeous! thanks for showing how to do them. I especially like the Joseph's Coat technique. Great cards! Love how you made the sentiments the focus of the cards and the backgrounds are so pretty, especially the gold on black! Wonderful cards! Thank you for the videos they are so helpful. I will be casing these cards for sure. I couldn't decide which poppy stamp to get but I am getting the poppy garden one for sure. I agree that the new pretty sentiment is a must have set too. I'm a new Comer. 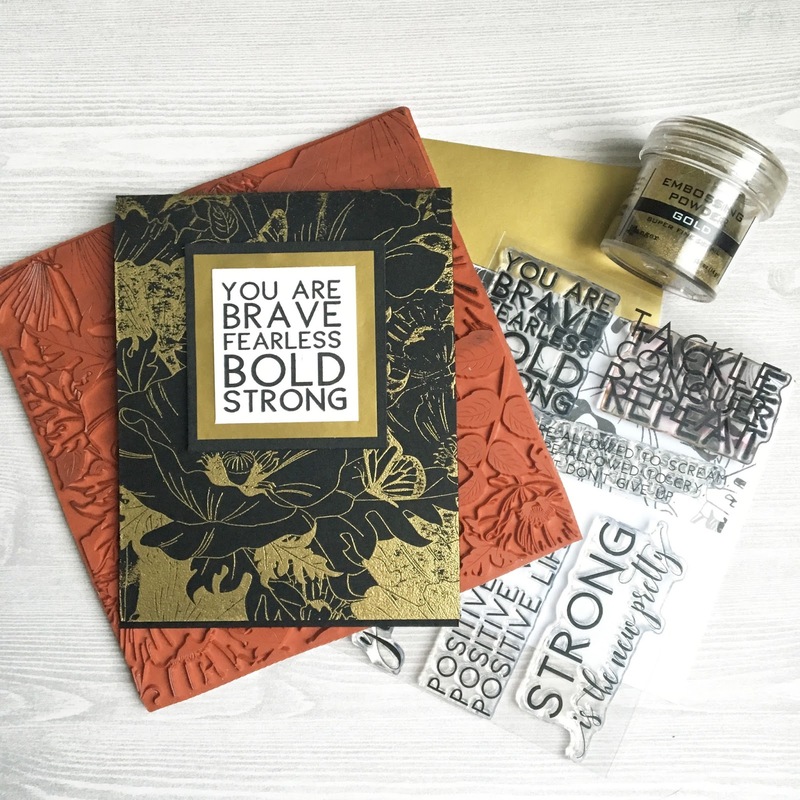 I just love you're gold embossed background stamp. It is beautiful. Even though your sayings are great, I hated to see so much of the flower covered. Thanks for you video. Awesome backgrounds for those pretty sentiments! Fabulous cards! Your cards are gorgeous, I love this poppy garden stamp. Beautiful card. Adding the insert and the envelope to match were awesome. Your other cards are great too. Thanks for sharing your talents. 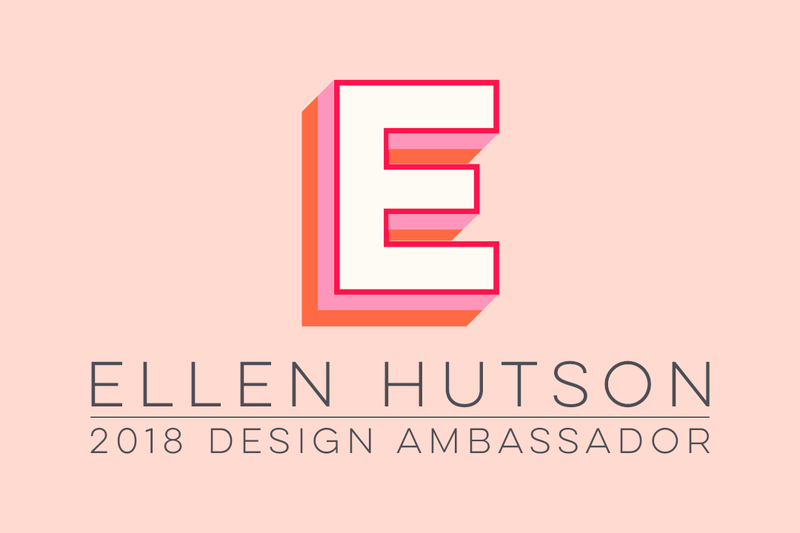 I'm so thrilled to see your abundant creativity and talent featured as part of this hop! Your love for the Ton products infuses your designs; your cards and envelope are absolutely stunning! Your video, as always, is marvelous! Beautiful 2,and thanks for the videos ! pigment inks work very well as the ink stays on top of the card a while, the blending is very easy. sure is a technicolor coat, very pretty. love the black one! Great job! Love that technique. Awesome video and beautiful projects! Beautiful cards Justine, adore the first card, love the black and gold. Beautiful cards, love them both and awesome videos too! Speechless....stunning cards and videos too! Beautiful and classy all in one! Justine, your cards to so classy! Love them both! The embossing makes your cards so elegant and rich looking! Thanks for reminding us to use background stamps! Really beautiful cards! Love how you showed off that background stamp! Beautiful! Gold embossing always looks elegant! I absolutely love the classy style The Tony brings to the table. Love your videos. Wow, two gorgeous cards!! I love the black and gold color combo; so elegant! So much inspiration!! Love the gold embossing on black with the coordinating envelope. And the Joseph's Coat technique is fantastic! 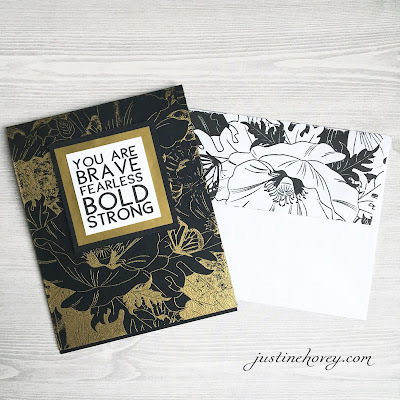 I love how you did the beautiful background stamp in gold and black! No coloring required to be beautiful! I love the sentiments! beautiful cards. Oh the second card is so cool with the mix of colors! Love your cards. I want to try the Joseph technique. A challenge for me. Thanks for sharing!! Love what you did!! Both cards are beautiful, but the black and gold stands out more, Cheers Anna. Hi Justine, your cards are both stunning and I can't wait to try them for myself. The gold against the black is always a show stopper, for sure! Very elegant. I love the matching envelop set! Lovely cards! Gorgeous cards especially the second card! I need to try the Joseph Coat technique. They're both beautiful, but that black and gold is a stunner! I love your techniques! The cars are beautiful! Beautiful cards, Justine! Black and gold is a perfect color combination. Pair of WOW cards, I just love them! Beautifully graphic! Wow! These cards are amazingly beautiful! What great card designs! This really gives the bold sentiment the importance it deserves. Fabulous! Great cards and thanks for the videos. Love both of them, I have to try the second technique (I can't remember the name LOL). Great cards, great videos! Simply amazing cards! Love that one is in monochrome black and gold, while the other is colourful! Your cards look gorgeous! I really love the gold and black!! SO classy! Really cute cards! Love the gold embossed background. Thank you for the videos! You have definitely inspired me to take another look at my background stamps! I also love to decorate my envelopes. It just adds that little extra touch to finish off a handmade card. I always appreicate it when videos are posted. I learn so much from them. I just subscribed to your Your Tube channel. Thank you. Fantastic cards, love both of them! The gold and the black looks so beautiful. It really looks like a purchased card. Beautiful! Thanks so much for all the information & for sharing your wonderful creations! Such beautiful and encouraging cards!! Love your video!! Thanks so much for your video tutorials! I love how you used that beautiful background stamp with different techniques! What a great example of how to use the same stamp for two entirely different looks. Both cards are beautiful, and I enjoyed your video. Oh my goodness! Your cards are stunning and I enjoyed your videos. Great work. Beautiful! Always love gold embossing and your card is stunning. Also great to see an older technique on the second card. your cards are the best in this day, there are elegants and so beautiful!!! Beautiful cards! I love the sentiments from the new release. The gold on black looks gorgeous! Beautiful cards, very pretty. Thanks for sharing and for a chance to win. 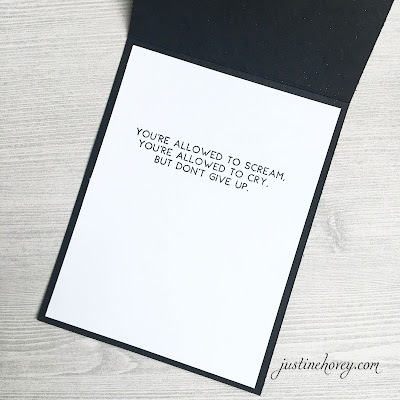 Inspiring cards! So elegant and beautiful! Gold and black, a winning striking combination every time and made even better by using the poppy garden stamp. I really like your use of the sentiments with this stamps. Poppies are so strong and hardy, perfect with your sentiments about never giving up. Wow! First, thank you for your informative on how to replicate your card techniques! Second, your cards are amazing! I love your color choices! Thanks for the envelope stamping idea! Great layering of the sentiment to bring attention to it! black and gold is a perfect match! beautiful cards! You're correct about the sentiments you used being wonderful. There are some really great stamps in this release and your cards show them off so well. Thank you for sharing your beautiful artistic work. Beautiful cards! Love the gold embossing! I love all your cards!!! The sentiment set is one of my favorites! Thanks for the inspiration! I love these new encouraging sentiment stamps! Both of your cards show them off wonderfully! The first one is so powerful! Your cards are gorgeous! Wow! Love your cards!! A nice change from most everything we've been seeing. Great videas as well! And I'm going to have to try the technique you used on the last card. And I agree - some wonderful sentiments in the release! Both of these cards are stunning! The envelope is an awesome touch! I absolutely love this technique and the stamps you used. I wish the stamp set The New Pretty was in stock because I'd buy it in a heartbeat!!! Justine, these cards are exceptionally gorgeous, just my perfect cards. Love this stamp and have to have it ASAP.